Duvet cover in sateen of cotton (thread count : 380), dark blue slate color, embroidered with shiny silver grey thread. 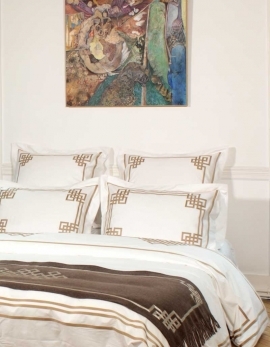 The duvet cover is embroidered on the front side around 25 inches from the top border (to avoid that the embroidery be hidden by the pillow cases) and as well at each bottom corner joined by a double embroidered line. French fabrication. 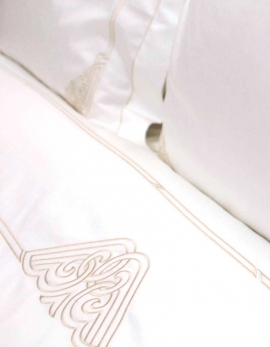 Duvet cover in white satin of cotton (380TC), embroidered with silver grey thread. The duvet cover is embroidered on the front side around 25 inches from the top border (to avoid that the embroidery be masked by the pillow cases) and as well at each bottom corner joined by a double embroidered line. French fabrication. White percale of cotton duvet cover embroidered with silver grey thread. Superior grade sateen (280TC). The duvet cover is embroidered around 25 inches from the top border (to avoid that the embroidery be hidden by the pillowcases) and as well at each bottom corner joined by a double embroidered line. French fabrication. 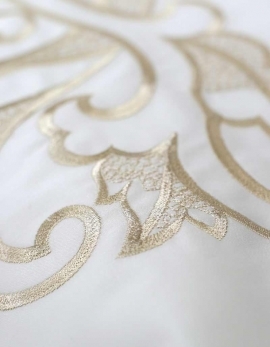 Duvet cover in luxury white satin of cotton embroidered with golden color satin ribbon. 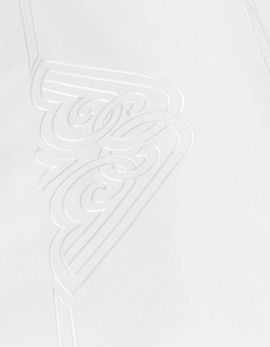 The embroidery is running all around the front side of the duvet cover with embroidred patterns at around 60cm from top border and at each bottom corner, joined altogether by parallel ribbons. Made in France by Badam TS. 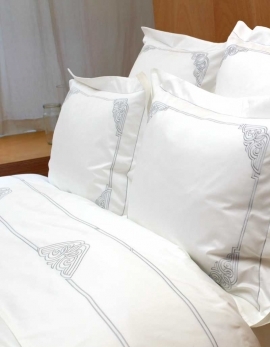 Duvet cover in satin of cotton (380TC), white color, embroidered with shiny white thread. The duvet cover is embroidered on the front side around 25 inches from the top border (to avoid that the embroidery be masked by the pillow cases) and as well at each bottom corner joined by a double embroidered line. French fabrication. Duvet cover in percale of cotton (280TC), white color, embroidered with light goldish yarn. The duvet cover is embroidered on the front side around 25 inches from the top border (to avoid that the embroidery be hidden by the pillowcases) and as well at each bottom corner joined by a double embroidered line. French fabrication. 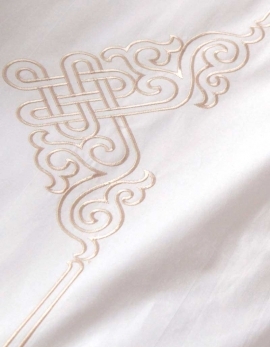 White duvet cover embroidered with light goldish thread. Exclusive satin of cotton (380TC), long fiber. The duvet cover is embroidered on the front side around 25 inches from the top border (to avoid that the embroidery be masked by the pillow cases) and as well at each bottom corner joined by a double embroidered line. French fabrication. 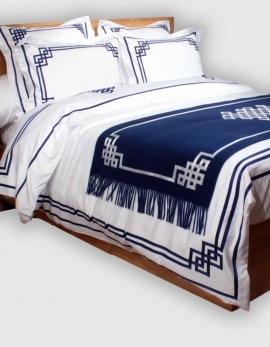 Duvet cover in white satin of cotton of superior grade embroidered with dark blue navy ribbon. 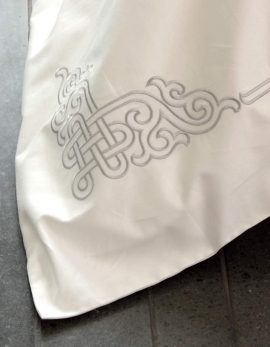 The embroidery is running all around the face side of the duvet cover with trimming drawing at around 60cm from top border. Made in France by Badam TS. Duvet cover in superior grade white satin of cotton, embroidered with pearl grey ribbon. 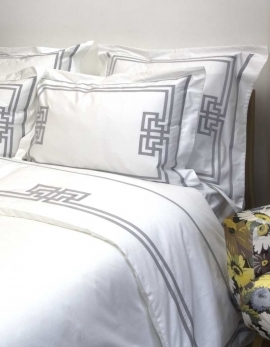 The embroidery is running all around the duvet cover with geometrical drawing at around 60cm from top border in front of each pillow. Made in France by Badam TS. Custom-made size upon order : just contact us.